JACKSON HEIGHTS — There's a new halal champion in Jackson Heights. 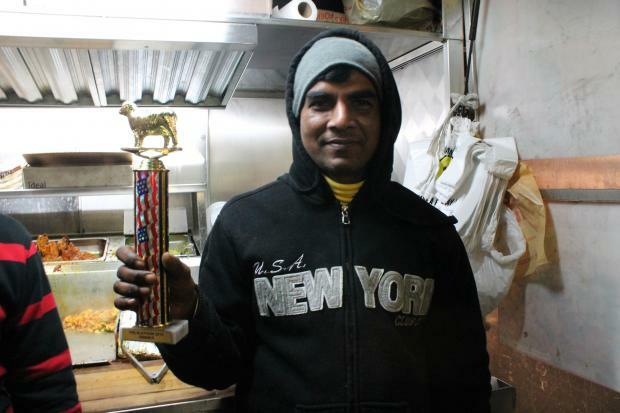 A group of Queens foodies awarded a lamb-topped trophy to the halal food cart on the corner of 74th Street and 37th Avenue, declaring it the winner of the first-ever "Halalathon," a search for the best halal in a neighborhood loaded with options. Three judges were joined by 10 lucky volunteers to try food from 11 different spots within a mile radius of the Roosevelt Avenue/74th Street stop in Jackson Heights. One of the judges, Jeff Orlick, 31, who runs food tours through his Queens food blog Jeffrey Tastes and helped organize Woks and Lox in December, said he'd always avoided the carts, thinking they were nothing more than plain street food. But since trying all of the neighborhood's options to prepare for Halalathon, he's come to appreciate the cuisine, he said. "It's a New York thing," said Orlick, a Jackson Heights resident. "People want their food cheap and quick, on the way home from work." Orlick was joined by Rachel Antonio, 34, a contributor to the blog Queens Love who writes the blog Spam is Better Fried and lives in Sunnyside, and Desmond Chow, 37, a friend who lives in Bay Ridge, to find the best of the best in Jackson Heights. The nameless winning cart was presented with the Halalathon trophy after beating out storefronts like American Chicken at 78-07 37th Ave., and former Vendy award-winning cart Sammy's, at 73rd Street and Broadway. Ultimately, Antonio said, the taste of the winning cart's food was less greasy and better-cooked than the other options. "The rice, lamb and chicken should taste good, regardless of the sauces added to it," Antonio said. "It's all balanced. There's no one side that's overly-balanced." "I like that they put some coriander on it," said Jojo Kaur, 19, a student at City College. "They have a halal cart on my campus, too, but they're just OK."
Nermal Das, 48, said he comes to the cart regularly because his children love it. "Whatever he does, it tastes better," Das said of the cook. The trick, cart-worker Muhammed Alam said, is the marinated chicken, which is doused in a Shan seasoning. The voting process went through two rounds in December and January, the judges said. First, all 13 tasters tried a group of carts near 74th street. In the second round of voting, they tried food from around 82nd Street. Finally, they narrowed the choices down and crowned a winner. Orlick's expectation was that Sammy's would come out victorious in the Halalathon, and he was surprised to discover that the cart he calls "the TD cart" because of its close proximity to the bank was the unanimous favorite. "These guys won hands down," Orlick said.